Clayton Miller, Stuart Isaascon and Donnie Isaacson of PalletOne accept their award. 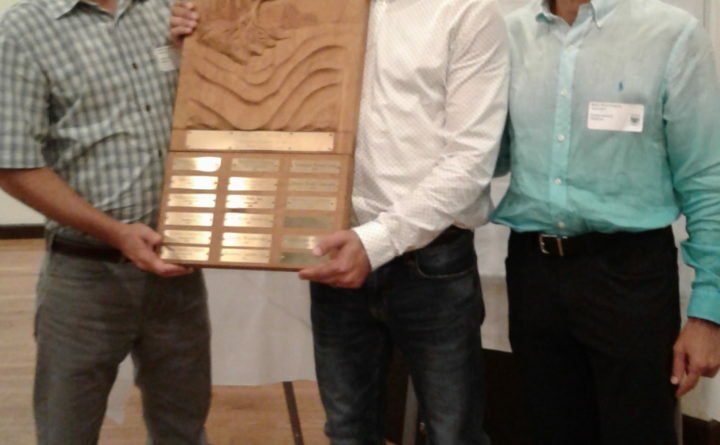 At a recent awards banquet held in Waterville, the Maine Wood Products Association (MWPA) presented its Pine Tree Award to Pallet One of Livermore Falls and its Pine Cone Award to Shaw & Tenney of Orono. In addition, the UMaine School of Forest Resources received special recognition for their dedication in the advancement of wood technology impacting the wood products industry. “This year we also recognized the University of Maine School of Forest Resources for their technological advancements impacting the wood products industry through their research at the Advanced Structures and Composites Center and the Forest Bioproducts Research Institute,” Cornish continued. The Pine Tree and Pine Cone Awards are presented each year to two MWPA members who are Maine based wood products manufacturing companies that have taken innovative steps in the prior two years to strengthen their businesses. Acquisitions of other businesses, investments in current operations, the addition of major equipment or new product lines, and sustainability efforts are just some of the creative things former winners have been awarded for. The winning companies also promote the Maine Made Americas Best theme. The Pine Cone is awarded to one of our smaller members and the Pine Tree is awarded to one of our larger members. Stuart Isaacson, area sales manager and Donnie Isaacson, VP and regional manager of PalletOne, accepted the Pine Tree Award on behalf of their company. PalletOne is the largest pallet manufacturer in the U.S. with 17 facilities in 9 states. The facility in Livermore Falls, originally Isaacson Lumber, employs over 175 Mainers. The Livermore Falls facility is FSC Certified, all logs harvested come from land that is FSC, SFI or Tree Farm Certified. They have an aggressive pallet recovery and remanufacture program and run their plant using Lean Manufacturing principles. The Pine Cone Award was presented to Steve Holt and Nancy Forester-Holt, caretakers to the Shaw & Tenney legacy. Shaw & Tenney has been producing the world’s finest traditional oars and paddles in Orono, Maine since 1858. Shaw & Tenney is the second-oldest manufacturer of marine products in the U.S. Shaw & Tenney was awarded the Pine Cone Award as a smaller company but their impact is anything but small. They have expanded their traditional offerings to include boathooks, masts, spars, flagpoles and custom engraving on their products for awards and art. They offer time honored traditional craftsmanship in their products but all are manufactured to be 100% sustainable. Shaw & Tenney have utilized their website, social media and the internet to bring their Maine craftsmanship and products worldwide. They were also noted in MaineBiz as as one of Maine’s Top Ten Iconic Products. Dr. Douglas Gardner accepted special recognition from the Maine Wood Products Association, on behalf of the UMaine School of Forest Resources. The research being done at the Advanced Structures and Composites Center and the Forest Bioproducts Research Institute is critical to the advancement of the wood products industry. Their research on cross laminated timbers, wood composites pilot manufacturing, nanotechnology, and biomass will directly impact wood manufacturing in Maine. The awards were presented at a banquet on September 21 at O’Brien’s Event Center, Waterville, Maine.